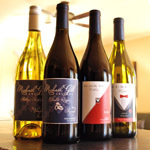 The Michael Gill Cellars Wine Club offers three shipments each year at a special member’s discount of 20% off the regular wine price. These limited vintages, often available only to wine club members, represent our finest offerings. Our beautiful vineyard cottage is also available exclusively to members. Club Members have the option to choose either four or six bottles per shipment. Wines to be included in the club are chosen by the vintner as the best reflection of the winery’s current vintage, and may include pre-releases. Special member’s only access to Michael Gill Cellars vineyard cottage. Complimentary wine tasting for club members and up to four guests. Three wine offerings per year with fall, holiday, and spring shipments. Your choice of shipping or will-call at the winery. Please call the winery at (805) 239-1668 to sign up!